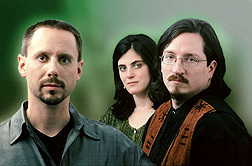 Kevin Keller is wont to call his work "ambient chamber music." That cool description is fairly apt, seeing as how the modern electronic composer fuses his elegaic willpaper with the sullen acoustic sounds of cello and piano. Whether whirring, roaming or purring, Keller's music breathes like spirits gathered in a huff, scurrying through some black forest of the mind to produce a most magnetic - and provacatively haunting - echo. 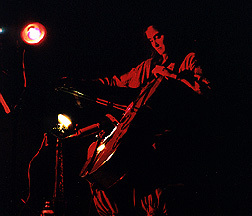 Joining Keller when he comes to town this Saturday will be Philly native Tania Simoncelli on cello and Mark Fassett on electric bass, a texture that will surely push his sonic landscapes into the fuzzy red. The City was oppressively hot tonight. Add to that some engineer's neglectfully forgetting to include central air in the blueprints during the construction of our gorgeous Cathedral. I guarantee all in attendance at tonight's Gathering are in dire need of a shower. In search of a brief respite from the heat, between the sets of Jeff Pearce and Kevin Keller tonight, a great many of us had fled to the exit and stood out on 38th St., I personally noting a sensation like that of being oven baked, even while outdoors and after sunset. I figured, looking up, that maybe the nice half moon was tossing us the heat; or maybe fiery Arcturus. Not too many stars to be seen in the city. That's kind of sad. But what's to worry about? There was an evening of most extraordinary music to be enjoyed. My own personal longing for tonight started over one year ago, just after a previous Gathering, when I was inspired beyond words by a sublime musical evening of Jeff Pearce and Ma Ja Le, augmented later by a blessing from Jeff Pearce himself; a gesture of kindness; a sampling provided of a release then yet to be, his heavenly 'Shores'. A million thanks to Chuck van Zyl for joining Jeff and the Cathedral tonight. 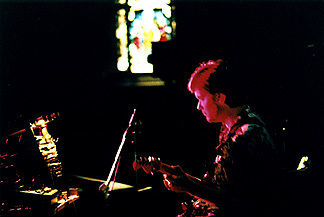 The venue and Jeff's music were made to be joined in holy matrimony. 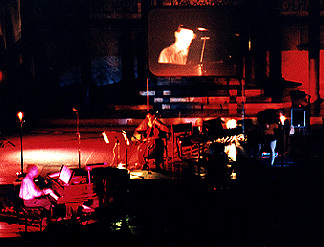 Visual images accompanying Jeff's performance created by Ken Jenkins, projected on a large screen and choreographed splendidly to the gentle movements of the music, only added to the transcending effects. Then, to add fuel to tonight's warm fire, "Songs for the Gathering", Jeff's limited edition CD-R available at the show, permitted us to take his portion of the evening home with us. The Kevin Keller Trio's performance, to put it bluntly, simmered. 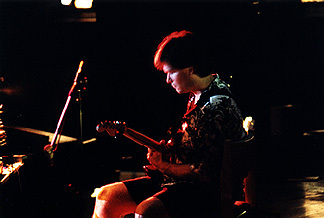 The music of Kevin and trio members Tania Simoncelli, cellist (a name to fit, there) and bassist Mark Fasset, was a perfect contrast to Jeff's. A twin bill well thought out here. I see where Kevin's music is classified as "Ambient Chamber Music" which, I suppose, is as good as any, yet I wonder if the music can be pinpointed to any description at all. I heard another Gatherer saying she was reminded of Joe Jackson at points, at other times baroque, sometimes Moorish, then sometimes as being atmospheric and spacey. Whatever was happening at any time during the Keller set, believe me, it can be safely described as being extremely well polished and effective. Unbelievably talented and just as lovely cellist Tania Simoncelli and Kevin Keller's keyboard communicated perfectly. As the evening came to a close, with it not seeming quite so warm anymore, Kevin paused to explain the creation of 'Distanced', a collaborative piece from his Pendulum CD with Jeff Pearce. This melancholic piece came to be through an exchange of tapes. Kevin from his San Francisco home. Jeff from his in Hoosierland. Fittingly, the two artists met for the first time tonight, meeting onstage at evening's end, sending us away with 'Distanced'; Kevin's quiet keyboard, Jeff's shimmering guitar, then back, refreshed, into the city heat. Despite a sweltering late spring heat wave, I experienced one of the best Gatherings ever! Jeff opened with several shorter pieces. The first was very light, yet intense organlike sustained choruses that he added some soaring solos on top of. His second was gentle echoey notes in a delightful melody. The third was pure angelic voices. Later he did what I can only describe as a "kinder, gentler" wall of sound, powerful, but not totally in your face. Jeff then had three audience members (I was one of the lucky ones!) pick a note, pitch, etc for his last piece, we picked C-natural-major (whatever that means, I'm not a musician :-) Anyway, it worked out for Jeff who pointed out that this 'experiment' had gone wrong at a prior concert. All throughout, Jeff showed an uncanny knack for melodies that captivate. I feel this is his strongest area, ever since I first heard "Fragile Air" on Echoes years ago. The lighting was simple so as not to take away from the custom computer graphics being projected from behind. Various kaliedoscopic images were mixed in with a star field and scenes of galaxies and planets. Next Kevin Keller with his cellist and bass player took the stage. They opened with a contemplative chamber piece. Next they shifted gears entirely. Kevin had a CD-R with all their sequences on it (easier than lugging a rack of synths cross-country!) The CD provided a background for a wonderful upbeat jam. 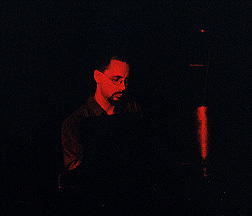 You could see how much Kevin was enjoying himself on the keys. The bass line sounded like it was either microtonal or an alternate tuning, it sort of reminded me of Robert Rich's more rhythmic works. The piece "Pale Unkempt Hours" carried with it a driving bass line, strangely familiar. Then it hit me, this is the same bass line from Angelo Badalamenti's "The Pink Room" (pt 2) from the Twin Peaks movie. Convergent evolution? Other pieces had a somewhat jazzy feel to them as the group continued their intense jamming. 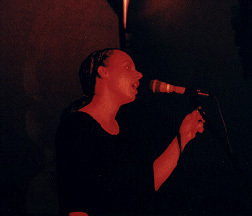 The trio became a foursome as a vocalist was added and the music took on a very ethnic feel. 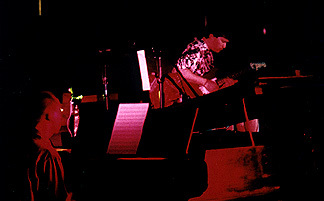 Finally for the encore, Kevin and Jeff performed a work that they had only done entirely by tape exchange before. Overall, we heard lots of great melodies and jams in a concert of many moods. Yeah, it was hot in Philly that night...but what transpired in The Cathedral last Saturday could inspire one to redefine the evening as sultry. 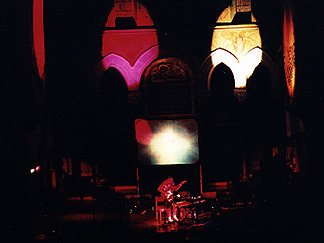 Although the gorgeous venue was indeed without air conditioning, I swear, as the first notes from Jeff Pearce's guitar filled the church, the temperature magically seemed to drop. His music gently wafted over the audience, almost like a breath from heaven. I would like to back track here and join the grateful chorus of attendees thanking Chuck van Zyl for his Herculean efforts at bringing these wonderful events to fruition. How Chuck (who, I might add, exudes an aura of coolness personified as he glides on and off the stage between performances, his long, wavy hair flowing behind him) and his crack crew manage to pull this off month after month is beyond me...I too, am only happy that they do. I must confess, that coming into this Gathering, I had my trepidation's as to whether music so incumbent upon technical wizardry could be pulled off live. After last Saturday, I can now say I'm ready to go ten rounds with anyone who maintains that the definitive way to enjoy space/ambient music is cloistered in a dark room somewhere. I have not the musical know-how nor technical jargon to describe how the musicians do what they do. I can only articulate what the music did to me. Jeff Pearce's set served to prove how the live experience surpasses merely the aural, it permeates all senses. One could actually visualize the lush, sustained backing chords gracefully arching high overhead, while the guitar melodies seared palpably right through the solar plexus. The visual impact was highlighted by Ken Jenkins' stunning imagery- fluidly evolving from Technicolor to pastel shapes, pulsating along with the music. The Cathedral itself proved to be not only acoustically superlative, but atmospherically perfect in every respect. 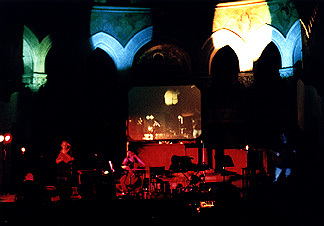 The frescos above the asp of the church were intermittently illuminated by the light show during both sets, providing a breathtaking backdrop. My best friend (who gamely and, bless her heart, enthusiastically accompanied me to the concert) and I concurred, the empirical sensation of witnessing Pearce's music was akin to being enveloped in a sweet, tender embrace. In this sanctuary, the mind is free to drift into the most serene and ethereal places. My favorite piece, "Lattice of Memory" inspired just that phenomenon. An effervescent, buoyant work, it evoked the image of veil after veil of glitter-bejeweled tulle graciously bestowed upon the audience. I've already worn a deep groove in track #2 on the week-old CDR I brought home with me that night. What Made Jeff Pearce's live performance even more impressive was the fact that (I think) he used no prerecorded backing tracks. 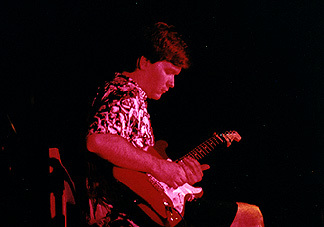 How he manages to create such varied and multifaceted effects using only that guitar must involve some kind of sonic alchemy. For the close of his set, Jeff demonstrated absolute brevity. He actually involved audience participation (yours truly included) in picking the elements upon which he predicated his closing number. Based on those random cues, he improvised a charming vignette that sent the audience blissfully off into intermission. I will admit here, that my raison d'etre' for the Gathering was to see Jeff Pearce. Having said that, I was more than pleasantly surprised by what took place when The Kevin Keller trio took the stage. The set deftly ran the gamut from elegant, luxurious chamber music to cool funky jazz to an absolutely sizzling mid eastern-tinged crescendo...and back. The prerecorded elements were seamlessly blended with the live music, creating a compelling, sophisticated performance. Cellist Tania Simoncelli was positively captivating. Her face, as she coaxed those lovely, languid notes from her instrument...oh my, it was clear that the music was coming from deep within her soul. I found myself actually pouting when her enchanted bow was in the rest position. Keller's set took on an entirely new dimension when the vivacious vocalist Ko-Shin graced the stage. She undulated and grooved to the music, as her angelic voice sailed above. I was so caught up in the mood...it was impossible to sit still in my seat. The evening ended with a most apropos closure. 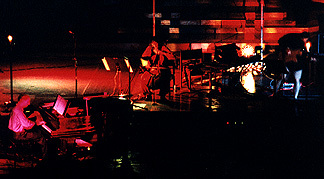 Jeff and Kevin joined forces to perform "Distanced" live, which they had only done via long distances before. The juxtaposing styles of the two artists, joined together in both space and time, for the first time, folded into one another brilliantly, creating a delicious concoction. The perfect nightcap to an evening of sublime, symphonious delights. In case you haven't heard by now, Saturday, June 10, 2000 was an excessively hot night in Philadelphia! The temperature was quite high also. The Jeff Pearce/Kevin Keller Trio Gathering at the Cathedral was an event for the millennium! Inside the Cathedral, it was sweltering. Chuck van Zyl introduced the show and Jeff came out looking very unlike a musician but looking very comfortable in his stocking feet. He launched right into some of his signature textured guitar work. 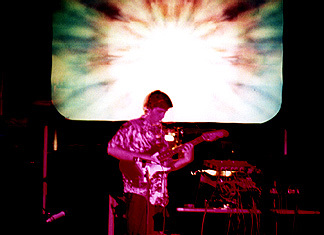 He used no tapes or other instruments; only his guitar, a processor and a delay unit. He also used a slide at appropriate moments and A BUTTER KNIFE! 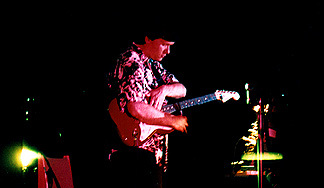 [Jeff had learned this glissando technique from Tim Story who had learned it from Steve Hillage (of Gong and 777 fame) who had learned it from Daevid Allen (also of Gong) who had learned it from....] He used the knife to create multiple layers of music for his immense and minimal soundscape. The first three pieces were very much in his "enlightened" minimalist style, ala To the Shores of Heaven. 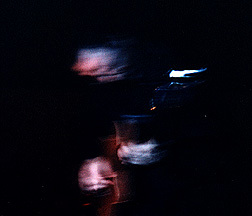 During a break, he introduced the next piece as somewhat darker and the piece to follow as "Something different for me." It was a completely unique composition in a completely unique style. The only way I could describe it would be as "pickin" and "processin". (Jeff later shared with me that the music of our own Chuck van Zyl inspired that piece.) For the encore Jeff admitted that encores are rehearsed and planned not improvised and spontaneous. He asked three audience members to choose from A - G, sharp, flat or natural and major or minor. (I chose natural. I was on stage with Jeff Pearce!) The encore, played in C, natural, major, was both beautiful and delightful. After a very brief intermission, Chuck introduced The Kevin Keller Trio; Kevin Keller on piano, Tania Simoncelli on cello and Mark Fassett on bass. Their first piece was mostly acoustic and very unpretentious. It was straight chamber ambience, a testimony to Kevin's classical background. After that piece, Kevin kicked in the tapes and the pace picked up. No, it shot up! Kevin's piano offset and complimented his electronics very nicely. Mark's bass added a throbbing rhythm that had him jumping and swaying all night. (In the heat, his stamina was remarkable!) Tania played a cello that could make an onion cry. She was obviously moved by the music.The highlight of the set was a wordless vocal by Ko-Shin on the finale, Iris by Night. For an encore, Jeff and Kevin performed a piece from Kevin's 1999 release, Pendulum. They co-wrote "Distanced" and performed it together for the CD via tapes via the mail. They had not met each other until Saturday afternoon. The live performance was moving, spiritual and provocative. And it was special! It was tight. It sounded like two old friends who had been playing together for years!